Root canal retreatment, also known as endodontic nonsurgical retreatment is a procedure that is carried out on a tooth that previously had root canal treatment. 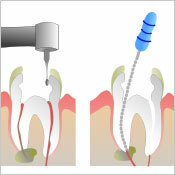 Because of the complexity of the procedure, it is usually done by an endodontist. There are several reasons why a previously root canal treated tooth can fail. The most frequent reason is persistent of microorganisms in the root canal due to failure to remove all of them at the time of initial treatment. Another reason is the reintroduction of microorganisms into the canal system after initial treatment was completed mainly due to coronal microleakage. 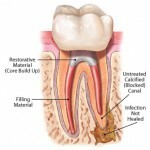 Coronal microleakage can be due to decay or loss of the restoration on the part of the tooth above the level of bone. This allows microorganisms to enter into the tooth which can get to the end of the tooth in as little as 7 days even with the roots filled. Insufficient root canal cleaning and shaping. For a root canal to be successful, the canals must be thoroughly cleaned and sealed. Curved, narrow or calcified canals are more difficult to clean and shape with the normal root canal instruments, this will cause part of the canals left untreated and allow microorganisms to persist in the root canals system. Other reasons are inadequate obturation, root canal calcification, vertical root fracture, inadequate protection from restoration and last but not least, operative errors. When your pain did not subside or get worsen few days after root canal treatment was performed, it is a sign where the root canal treatment had failed. The pain maybe spontaneous but often it is initiated by chewing or biting pressure. It is also advised to visit your dentist when there have been a history of episodes of facial swelling or swelling in the mucobuccal fold. When there is sensitivity and presence of a draining sinus tract on the tooth that have been root canal treated beforehand, do visit your dentist for a check up. Retreatment is the treatment of choice if it were decided that the procedure is feasible because the tooth is restorable, periodontally sound, and the root canal systems are accessible without any surgical approach. Most teeth being considered for retreatment will require removal of the previous restoration, thus, restorability after root canal retreatment is a major consideration. If crown-to-root ratio is compromised and excessive mobility is present as a results of chronic periodontitis, retreatment is contraindicated. In addition, there are several tooth-related factors that do not allow root canal retreatment to be done. These include situation where root canal space may no longer be accessible due to root canal calcifications or the presence of large well fitting post and core restorations. This would required surgical approach. The same applies for external resorption of root after initial root canal treatment. Extraction is the only choice for tooth with vertical root fracture. The risks of root canal retreatment are crown or root of the tooth fracture ; thinning, weakening, or perforation of the root canal wall ; ledges creation in the canal wall ; separation of instruments during retreatment procedure ; loosening of the crown which require fabrication of a new crown, and this will cost you more. Any one of these risks alone or combination may lead to extraction of that tooth. The benefit of retreatment is retention of the tooth in the arch. This will retain the form and function of tooth and reduction of the need for a more extensive and expensive prosthetic replacement if the tooth were to be extracted. First step is to remove the crown. 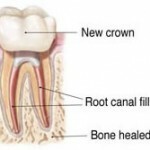 Most of the root canal treated tooth are supported by a crown coronally. This is to prevent sensitivity and allow mastication. 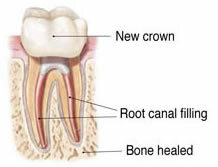 So, in order to gain access into the root canal during retreatment, crown need to be removed. This can be done using high speed handpiece with carbide or diamond bur. After removal of the crown, core and post need to be removed too. Typically, either a post remover or an ultrasonic handpiece is used to vibrate the post loose, then by using a hemostat or small-tipped forceps, grasp the end of the loosened post to remove it from the root canal. Gutta-percha, which is the most frequent used root canal filling materials, can be removed using hand and rotary files, heat, ultrasonics, solvents, and combination of all these. After that, cleaning and shaping is done again for the canal. If there is abscess present, drain the abscess and irrigate the root canal with copious amount of sodium hypochlorite solution. Then medicament is inserted into the canal and a temporary restoration is placed before it is re-open again for final cleaning and shaping. Then the canal is filled with Gutta-percha.A cement is also used to help seal the canals to prevent bacteria from reentering. In many cases, the opening in the crown of the tooth is sealed with a temporary filling. Sometimes by request of your dentist, the access opening in the crown is filled with a build up restoration. I just had a re-treatment two days ago. It’s good to know exactly what is going on. Thanks!